The presentation at the Algeciras Campus was attended by Ms. Inmaculada Santiago, Delegate of the Rector for the Bahía de Algeciras Campus, members of the Centre of Excellence, student collaborators, among others. For the period 2017-2020, the European Commission has awarded the Jean Monnet Centre of Excellence “MIGRATION AND HUMAN RIGHTS IN EUROPE´S EXTERNAL BORDERS” to the Area of Public International Law and International Relations of the University of Cádiz, a Centre which will be directed by the Professor Dr. Alejandro del Valle Gálvez. It is one of the fifteen Centres of Excellence granted worldwide by the European Union. The Jean Monnet Centre of Excellence “MIGRATION AND HUMAN RIGHTS IN EUROPE´S EXTERNAL BORDERS- “, aims to be a European and transnational Centre for training, research and dissemination on issues of Migration, Borders and Human Rights, with intense projection in the border area of the University of Cadiz itself. It will be based at the University Research Institute for Social and Sustainable Development (INDESS) of the Jerez Campus and will be integrated into the Campus de Excelencia Internacional del Mar (CEIMAR). The Centre of Excellence will carry out activities in the different campuses of the University of Cadiz, as well as in the Abdelmalek-Essaadi University of Tangier-Tetouan, and outreach activities in secondary schools and high schools in the province of Cadiz. It will have the participation of the University Classrooms of the University of Cadiz, of FUECA, of the Bahía de Algeciras Technological Campus Foundation, and the Europe-Direct of San Fernando and Algeciras. The main activity to be developed by the Jean Monnet Centre of Excellence will be the Bilingual Master in International and European Studies (International Relations, EU, Migrations and Human Rights), starting from the 2018/2019 academic year, at the Cadiz Campus. The concession of the Jean Monnet Centre of Excellence acknowledges the work of the Area of Public International Law and International Relations of the University of Cadiz in research and training in the field of European integration. The International and European Law team (http://catedras.uca.es/jean-monnet) has obtained four continuous I+D (2005-2018), and the European Projects of a Jean Monnet Chair “Immigration and Borders” and two Jean Monnet Modules on “European External Action” and “Immigration and Human Rights”. 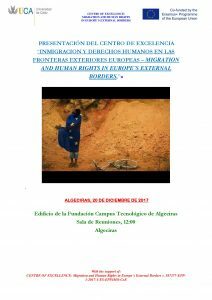 The International Law Area also publishes the international electronic journals Paix et Sécurité Internationales (with the University Abedelmalek-Essaadi of Tangiers-Tetouan) and Cuadernos de Gibraltar / Gibraltar Reports. The new Centre of Excellence places the University of Cadiz in the fields of Migrations, Borders and Human Rights as a centre of reference at an international and European level.